These days one of the main selling points of Halloween is candy. As if costumes and ghosts weren’t awesome enough, people thought you should coerce children in to celebrating by giving them treats. This has now turned into a sugar free for all consisting of thousands of bags of individually wrapped bite sized candies, because god forbid anyone actually make anything for their neighbors. Everyone knows the razor blade in the apple thing never really happened. Don’t get me wrong, I’m all for trick or treating. In fact, as an adult, I still kind of wish I could go. But then I realize the majority of those candies aren’t vegan so there isn’t really a point. I wonder what vegans with children do. Do you take your kids trick or treating and take away the candy afterward or skip the event all together? Luckily more and more vegan candies are coming onto the market so we aren’t just stuck with licorice and suckers. Go Max Vegan candies are new on the scene and replicate some of the more popular non-vegan brands. The Buccaneer, reminiscent of a Three Musketeers, has creeped in as my favorite of the four. I highly recommend throwing a few in the fridge as they are even more tasty cold. The Twilight is my next choice, though I was a particular fan of Milky Ways as a non-vegan. There some flavor in the caramel that doesn’t quite win me over. It’s still really nice to have a vegan candy that’s not just a pure chocolate bar. It’s easy to make some vegan candies yourself. I’ve successfully made peanut butter cups and peppermint patties that were even better than the mass produced ones. I’m still dying to make Your Vegan Mom’s crunchy version of peanut butter cups. Can someone please figure out how to make a vegan Junior Mints? That would be awesome. Oooh good vegan candy is the best! The Buccaneer sounds sooo good, I need to try this! I love the Go Max bars, I wish they were easier to get hold of in the UK though! 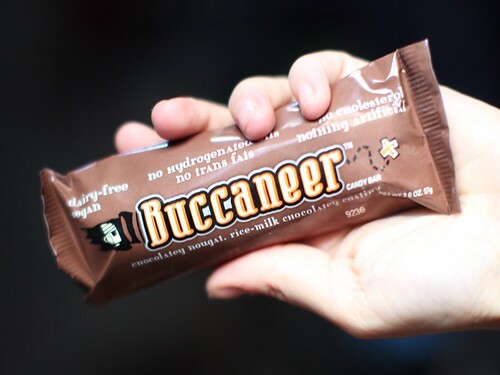 The buccaneer’s definitely my favourite too. Plus they sell peanut butter cups which I have tried. And a vegan crunchy bar which I want to try which is the only gluten free thing. PS. I found your blog on a community on LJ, can’t remember which! I’d like to try your peppermint patties someday. The Ritter Sport peppermint were my favorite vegan candy until they made them non-vegan. 🙁 Maybe Go Max Go will add peppermint patties to their list of candy bars even though I’m sure the ones you make are better. i reallllly want them to veganize Reese’s Fast Break.